For some reason I feel like I have been busy, busy, busy but I can’t say exactly where the time has been going. Oh wait, yes I can. It’s been cycling workouts and recovering from cycling workouts. I take part in group coaching which is pretty awesome and much cheaper than paying for an individual coach. Group coaching covers the coaches and the number of people they are coaching. So there are four coaches and they design a plan for eight weeks with a specific goal in mind, currently base building. That means increasing your aerobic fitness. Then there are a bunch of cyclists signed up to receive the eight-week plan and access the coaching forum where we can ask questions and get individual help and also encourage our fellow participants. There is also a nutritionist and a mental skills coach. It’s a pretty sweet set-up. I’ve been doing these coaching sessions since last October and they have been fantastic. I’ve had a number of people recently comment on how much stronger I have gotten. Yesterday was proof. There was a virtual team women’s race on Zwift and the way the categories were set I fell in as a high B category rider. But my team needed another A rider so I was “catted up.” The race was 40 miles/64 km long, twenty something women started the race in the A category, 17 finished. I crossed the line in seventh place. My teammates crossed in first, second and fifth. Since it was a team race, the team gets points for where each person finishes and the team with the most points wins. My team won! Proud of my teammates and super jazzed I was able to contribute to the team win and not make a fool of myself. Determination and all the hard work I’ve been doing is paying off! We’ll see how it goes next month when I get to race outdoors. Winter is still hanging on here. The good news is that we have reached that seasonal transition period when it isn’t quite winter but not yet spring. So we still get dashes of snow and cold but we also get warm weather too. Nothing extraordinary, though by Friday this week it might get as warm as 50F/10C! That is nothing short of exciting. With the transitioning weather and the longer days, the Dashwoods often get to wander out of their run in the evenings for an hour or so. There is now a small snow-free path from the coop to the deck and they meander back and forth on it, happy to be out. It’s a good thing they’ve been able to start getting out more because they are getting bored and grumpy and taking it out on each other. A little over a month ago we noticed Elinor had a small bald spot on top of her head just behind her comb. We’ve been trying to figure out what was going on as it has been slowly growing. It turns out Mrs. Dashwood is the source of Elinor’s baldness. When Elinor annoys Mrs. Dashwood in any way, Mrs. Dashwood nips at the feathers on top of Elinor’s head and sometimes manages to pull them out! There is no blood or scabs or anything, just missing feathers. But Mrs. Dashwood is getting nipped at by somebody too. She has a bare patch on her neck where feathers have been pulled out. Perhaps Elinor has gotten back at her? We’ve seen Mrs. Dashwood nip at Elinor but have not seen anyone nipping at Mrs. Dashwood. But someone has. Poor chickens. Hopefully as they get to go outside more and more they will stop picking on each other. And fingers crossed that it is warm enough in a few weeks for the plastic sheeting around the run to be taken down. That will help immensely too I am sure because they will once again be able to see out through the wire in the run. Everyone gets a bit stressed with a long winter! 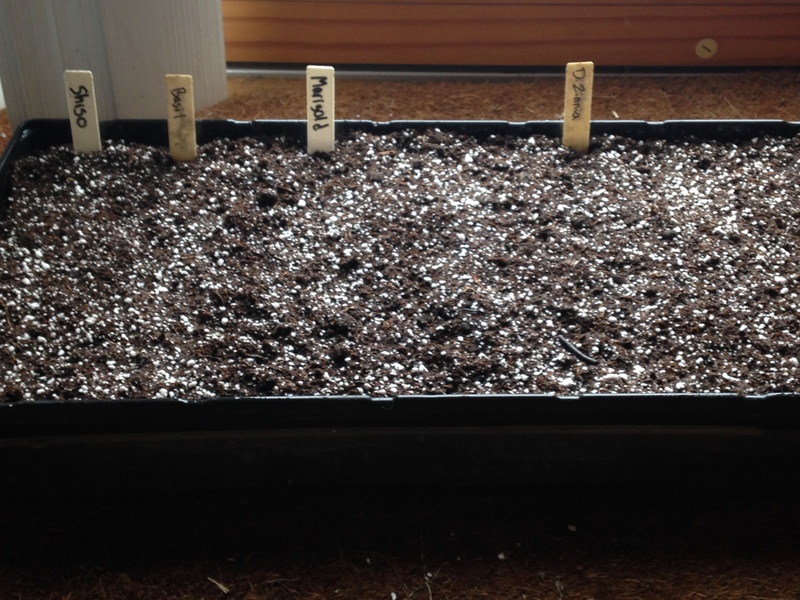 To ease my winter doldrums I started tomato and pepper seeds indoors a couple weeks ago. They are doing great! The tomatoes have sprouted up and most of them already have a small set of true leaves. The jalapenos are doing great too but because they took longer to germinate, have not yet gotten any true leaves. The eggplant and orange bell pepper seeds I planted did not sprout. Not a surprise since the seeds were a few years old. Today I filled a tray with seed starting mix and planted shiso, Italian basil, marigolds and dwarf zinnias. I usually make paper pots for these but decided to try seeding them in rows in the tray because I can plant more. It’s an experiment. We’ll see how it goes. The shiso seed is leftover from last year so germination might be spotty. The basil is fresh. The marigolds and zinnias are seeds I saved after last year’s plants went to seed. I decided I need one more grow light because the two that I have are above the tomatoes and peppers. The new sprout tray is going to need a light too. I could not for the life of me remember where I got the grow lights last year but Bookman remembered—he had to take one of the lights back because it arrived broken. So I ordered a light and it should be delivered to the home improvement store (free delivery to the store, not to the house) later this week, just in time for the new sprouts! And remember those donuts a couple weeks ago? 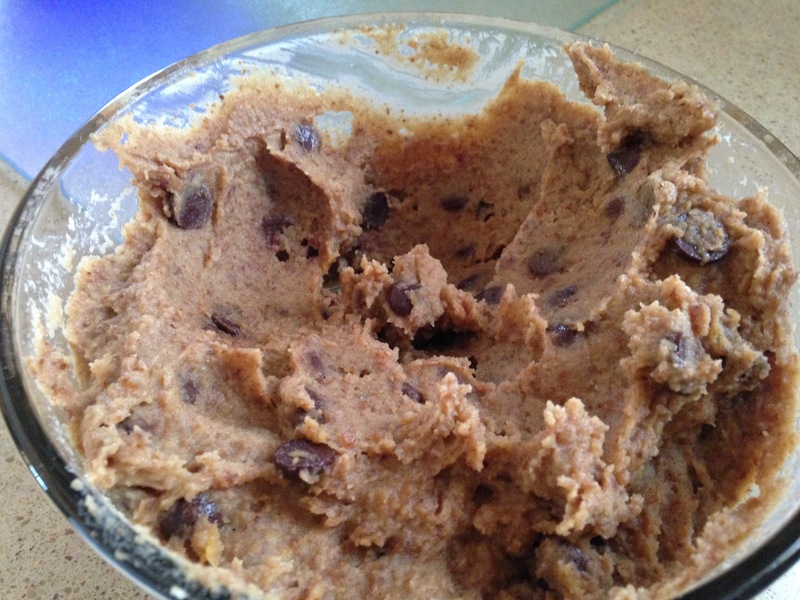 Well Chocolate Covered Katie came through again with a super delicious “cookie dough” recipe. The “dough” is made of chickpeas, almond butter, oats and a few other ingredients. Easy to make and so delicious! You’d think all I eat is dessert. Don’t worry, dessert pretty much only happens on the weekend. The rest of the time it is fruits and veg. I should probably tell you about some of those delicious recipes sometime, like the lentil and beet burgers that are dinner tonight. Or the bean curry and veggie pakoras last week. Pi day is Wednesday and Bookman will be making a shepherd’s pie to celebrate. Looking forward to that! I will try and get a photo before we dig in and an approximation of the recipe from Bookman. To begin with many congratulations on the team win!! You rock and you are so inspiring me in my effort to become more fit! Way to go! I love the recipe and I love that you are also getting to indulge in Veggie Pakoras…they are practically India’s national snack! lol! I do hope the weather gets warmer soon and the Dashwood’s can stop their “blood feud” and you can start the outdoor gardening again, though again in my part of the world, the later the summer, the better! Stefanie, I also needed to plant a few seedlings to get rid of the winter doldrums. I found a “wild blossoms” mix and can’t wait to see what happens! Also, I have a blogging friend, James at http://www.50in50marathonquest.com/, who just set up Zwift for his trainer in the “pain cave.” Maybe you can drop him a line and he can see the possibilities of the new tech! And wow… chicken politics. I wonder who has been nipping at Mrs. Dashwood. I thought she was matriarch? Congratulations on your team win! We have had really winter like weather here on Long Island. It has been cold, there is still snow on the ground, and we have up to a foot of snow in tomorrow’s forecast. Hopefully spring will come soon! Dashwoods would not be allowed in our neighborhood, What you say ? I’m expecting to see you in the Tour de France, if not the future Olympics! Your weather sounds exactly like us, spring is coming and going, allegedly it’ll be 9 C soon, then back down to 5 C. It seems like a never ending winter. What’s wrong with dessert all the time? 🙂 Please do share your other recipes. Always on the look for healthy stuff. And, congrats on doing so well with your team! I’m sure you can’t wait to get out and start training outdoors. Soon! I am so much admiring the power of your passion and your determination! Congrats on the cycling success and the increase in strength: terrific! And even though I love the snow and the winter, I am thinking of the critters and ready for the temperatures to warm and the growing things to sprout. This will be the first year we have successfully overwintered any plants (so far our jalapeno plant seems to be in good shape) and the first year we will have any of our own seeds to plant (morning glories). We have a very small outdoor growing space, but we love the idea of doing more of this in an apartment! Congratulations Stefanie. As always I’m so impressed by your dedication and achievement. As for Elinor, I don’t like to think Mrs Dashwood is picking on her. She should know better, and than Elinor is to be treasured. She just doesn’t realise how much she relies on her!! Seriously, I’m sure as you say that with warmer weather they’ll settle down. How old are they now? Time flies and I can’t recollect whether they are 2 or 3? I think they must be into their third year now?